Sometimes while downloading or importing your BrillKids curriculum, you may encounter an error saying the file is "corrupted" or "invalid." A possible cause for this error is that the download process was interrupted by an internet connection problem, so the file was not downloaded completely. When a content file is not downloaded completely, you won't be able to import the lessons in the file into your BrillKids software at all. Towards the end of the download process, your BrillKids software will verify the downloaded file automatically (e.g., if the file size of the file in your computer and in the BrillKids server have the same file size). If you're sure that your Internet connection is stable and that you are able to download other files (with a similar file size) with no problems, click on Continue Anyway and your software will proceed with importing the lessons. OR if you think there is a problem in your connection, you can try re-downloading the file by clicking on Download Again. Once the download and import process is finished, you can start playing your lessons! If you used a direct link (given by BrillKids Support staff) to download or re-download your content file, do make sure that you choose to "Save" file and wait for the download to finish completely. Once the download has finished, double-click on your content file or drag-and-drop it into your BrillKids software window. 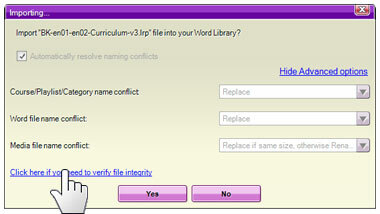 A small "Importing..." window will pop-up, asking if you want to import the file into your software's lesson library. Click on Show Advanced Options. The "Importing..." window will expand to show a few more settings. 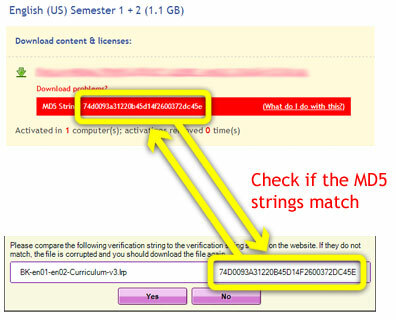 Click on the link that says Click here if you need to verify file integrity. 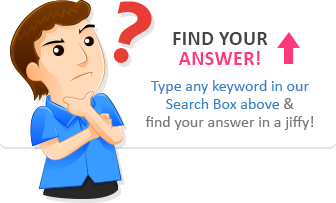 You will see a box showing the name of the file you are trying to import, with a set of numbers and letters written across the file name. That set of numbers and letters is called an "MD5 string" - take note of that string or keep that window open. Open your browser and go to the BrillKids Account page where the license key for your downloaded file is displayed (e.g., if you downloaded the Little Reader English Curriculum, go to Account > Purchases > Little Reader Curriculum & License Key). A red box containg the MD5 string for that file will appear. Compare the string shown in your account page with the one from your software's Import window and check if all the numbers and letters match. 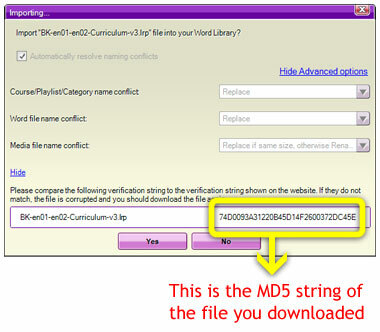 If the MD5 string in your account page is exactly the same as the one shown in your software's Import window, that means the file you have is correct and complete. 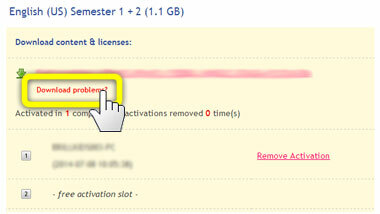 Go back to your software and click YES in the Import window to start adding the lessons to your software. Once that's done, you can start playing your lessons! 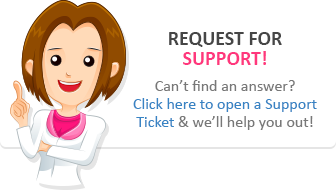 If you are still having problems with downloading your BrillKids content, please write to BrillKids Support and attach your diagnostic report.